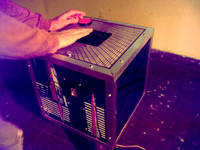 Follower is an interactive, electronic installation, with which individual users may 'play' through a free-standing, coin-op and track-ball console. The game is viewed on a large projection screen suspended several feet in front of this console. 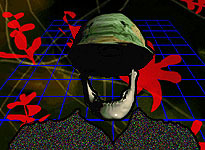 The title of the work defines three intertwined components of the work: the user is engaged in following/tracking a hidden enemy, the user is required to follow/obey directives from the commander -- General Jawbone, and the actions of the user are followed/monitored by other entities who are also unseen. The work is a hyperbolic video game which questions the heroic portrayal of authoritarian violence in American pop culture, and the methods of first-world military operations in the post-Vietnam era. The installation work begins as fast-paced, arcade-style adventure, with an abstracted enemy and gradually gives way to visceral photographic images, and references to "real-world" social content, such as the Iran-Contra affair and the Panema Invasion. Installation components include: Interactive graphical program, Macintosh computer, video projector, powered speakers, miscellaneous electronic circuits, wood, aluminum, steel, arcade coin-op, buttons and track-ball parts.